Still thought of today as the grand master of the polyphonic style, Palestrina was highly regarded and much published in his lifetime. His output comprises one hundred and four firmly attributed Masses, over three hundred and seventy-five motets, sixty-eight offertories, at least sixty-five hymns, thirty-five Magnificats, four (possibly five) sets of Lamentations, and over a hundred and forty madrigals. The six-voice Missa Ecce ego Johannes presented here is based on an unknown model. The text 'Ecce ego Johannes', from the Book of Revelation, is used for the chapter (capitulum) at Vespers on All Saints' Day, and it appears elsewhere (in the Sarum books, for example) as an antiphon at Matins for the same feast. The character of Palestrina's setting, however, suggests that it might well have been based on a polyphonic model. It is a powerful, confident work on a par with the Missa Papae Marcelli and Assumpta est Maria—just listen to the very first notes of the Kyrie. 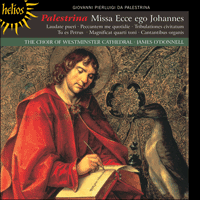 The motets that accompany the Mass show a more festive side to Palestrina, with exuberant melismatic writing. All of these pieces deserve to be better known and there can be no choir better equipped to show the world the beauty of this music. Still thought of today as the grand master of the polyphonic style, Palestrina was highly regarded and much published in his lifetime. His output comprises one hundred and four firmly attributed Masses, over three hundred and seventy-five motets, sixty-eight offertories, at least sixty-five hymns, thirty-five Magnificats, four (possibly five) sets of Lamentations, and over a hundred and forty madrigals. His publications bear dedications to men of great power: discerning and wealthy patrons of the arts such as Guglielmo Gonzaga, foreign princes and potentates (there are two books of Masses inscribed to Philip II of Spain) and, increasingly in his later years, popes. Tribulationes civitatum and Peccantem me quotidie are both penitential motets. The former appeared in the 1584 Motectorum liber quintus, published in Rome, the latter in Motettorum liber secundus, published twelve years earlier in Venice. Both make use of soaring melodic phrases and quite abrupt harmonic and textural contrasts: the block chords at ‘Timor’ in Tribulationes civitatum, for example, which clearly make the word stand out, or the subsequent harmonic change at ‘et super liberos’. At the end of the first part there is a real sense of imploring for mercy at the words ‘Domine miserere’, characterized by a descending motif. In the second part such procedures are continued; most remarkable of all is the sudden harmonic stasis caused by the use of pedal notes at ‘iniuste egimus’; this is followed by two sequential descents onto bare fifths at ‘iniquitatem fecimus’. Peccantem me quotidie is even more haunted by the need for repentance and the fear of death: the words ‘timor mortis conturbat me’ (so chillingly reiterated by the fifteenth-century Scottish poet William Dunbar in his Lament for the Makers) are set in simple block chords, but move symbolically into new harmonic territory. There is an audible darkening, so to speak, with the despairing descending phrases of ‘nulla est redemptio’, but with the startling plea for mercy at ‘Miserere mei, Deus’, the end of the work is bathed in the light of hope: these two motets seem to incarnate the dictum of the Orthodox monk Staretz Silouan, who said ‘Keep thy mind in hell, and despair not’. If it is still today unfashionable to read such spiritual concerns into this music, it should not be forgotten that Palestrina was working at the very centre of the development of Counter-Reformation spirituality: as Lewis Lockwood has written: ‘His career exhibits not only enormous artistic power and fecundity, exercised with great restraint, but also a strong religious feeling coupled with a sense of worldly purpose’ (‘Palestrina’, in The New Grove Dictionary of Music and Musicians). Laudate pueri, from the 1572 collection of motets, and Cantantibus organis, published in 1575, show the festive side of Palestrina, with exuberant melismatic writing and, especially in the former, for two choirs, a dextrous handling of textural contrast. The seven-voice Tu es Petrus, from the 1569 Liber primus motettorum, and less familiar than the later six-voice setting, is also a joyous celebration of confident faith in the church of Peter. Its seamless polyphonic flow, though not its harmonic language, suggests composers such as Morales and, especially, Gombert. The Magnificat recorded here is one of five which Palestrina wrote in Tone 4. He set the text of the Magnificat, in fact, no fewer than thirty-five times; sixteen of them appeared in the Magnificat octo tonum liber primus published in Rome in 1591. It is a pity indeed that they are nowadays somewhat little known, for they are quintessential Palestrina: the servant of the Church quietly writing magnificent music which speaks directly to mankind even—and perhaps especially—today. Giovanni Pierluigi da Palestrina (dont le nom vient d’une ville non loin de Rome) naquit probablement en 1525 ou 1526. Après être demeuré sept ans maestro di cappella à la cathédrale de sa ville natale, il partit à Rome, sur convocation du pape Jules III, pour devenir maître de chapelle de la Cappella Giulia (Saint-Pierre de Rome). Puis il fut chanteur à la chapelle Sixtine, avant d’être renvoyé par Paul IV, en raison de son inacceptable statut d’homme marié. Passé d’autres nominations, il reprit son poste de maître de chapelle à la Cappella Giulia (en 1571) et mourut en 1594. Aujourd’hui encore considéré comme le grand maître du style polyphonique, Palestrina fut, de son vivant, fort prisé et publié. Sa production comprend cent quatre messes d’authenticité avérée, plus de trois cent soixante-quinze motets, soixante-huit offertoires, au moins soixante-cinq hymnes, trente-cinq magnificats, quatre, peut-être cinq, corpus de Lamentations et plus de cent quarante madrigaux. Ses publications sont dédiées à des hommes de grand pouvoir: de riches et sagaces mécènes des arts, tel Guglielmo Gonzaga; des princes et potentats étrangers (deux livres de messes sont dédiés à Philippe II d’Espagne); et, de plus en plus vers la fin de sa vie, des papes. Laudate pueri, extrait du recueil de motets de 1572, et Cantantibus organis (publié en 1575) laissent voir le Palestrina festif, à l’écriture mélismatique exubérante et (surtout dans le premier motet, pour deux chœurs) traitant habilement les contrastes de textures. Tu es Petrus, à sept voix (extrait du Liber primus motettorum de 1569)—moins familier que le Tu es Petrus ultérieur, à six voix—est une autre célébration joyeuse de la foi confiante en l’église de Pierre. Son flux polyphonique homogène suggère, contrairement à son langage harmonique, des compositeurs comme Morales et, surtout, Gombert. Le Magnificat enregistré ici est l’un des cinq magnificats composés par Palestrina dans le ton 4. En réalité, le compositeur mit ce texte en musique pas moins de trente-cinq fois—dont seize parurent dans le Magnificat octo tonum liber primus (Rome, 1591). Il est fort dommage que ces œuvres soient, de nos jours, un peu méconnues, car elles représentent la quintessence de Palestrina—un Palestrina serviteur de l’Église, écrivant en toute quiétude une musique magnifique qui parle directement à l’humanité, même (et peut-être surtout) aujourd’hui. Giovanni Pierluigi da Palestrina (der Name geht auf eine Stadt unweit Roms zurück) wurde wahrscheinlich 1525 oder 1526 geboren. Nachdem er sieben Jahre als maestro di cappella der Kathedrale seiner Heimatstadt gedient hatte, zog er auf Geheiß von Papst Julius III. nach Rom, um Kapellmeister der Cappella Giulia am Petersdom zu werden. Später war er in der Sixtinischen Kappelle als Sänger tätig, wurde jedoch wegen seines unannehmbaren Ehestandes als verheirateter Mann von Paul IV. entlassen. Nachdem er eine Weile andere Ämter bekleidet hatte, kehrte Palestrina 1571 als Kapellmeister an die Julianische Kappelle zurück. Er starb 1594. Palestrina, der noch heute als der herausragende Meister des polyphonen Stils gilt, war zu Lebzeiten hoch angesehen und seine Werke wurden weithin verlegt. Sein Gesamtwerk umfaßt einhundertvier ihm eindeutig zugeschriebene Messen, mehr als dreihundertfünfundsiebzig Motetten, achtundsechzig Offertorien, mindestens fünfundsechzig Kirchenlieder, fünfunddreißig Magnificats, vier (möglicherweise fünf) Folgen von Lamentationen und über einhundertvierzig Madrigale. Seine Publikationen sind mit Widmungen an Männer in Machtpositionen versehen: anspruchsvolle und reiche Kunstliebhaber wie Guglielmo Gonzaga, ausländische Fürsten und Potentaten (zwei Bände mit Messen sind Philipp II. von Spanien zugeeignet) und gegen Ende seines Lebens immer häufiger auch Päpste. Tribulationes civitatum und Peccantem me quotidie sind beide Bußmotetten. Die erste ist in dem 1584 in Rom erschienenen Motectorum liber quintus vertreten, die zweite im Motettorum liber secundus, das zwölf Jahre zuvor in Venedig herausgekommen war. Beide machen von schwebenden melodischen Phrasen und recht krassen harmonischen und strukturellen Kontrasten Gebrauch: in den Tribulationes civitatum zum Beispiel die Blockakkorde bei „Timor“, die das Wort deutlich hervorheben, oder der anschließende harmonische Wechsel bei „et super liberos“. Am Ende des ersten Teils hat man bei den Worten „Domine miserere“, die durch ein abwärts gerichtetes Motiv gekennzeichnet sind, wahrhaftig das Gefühl, daß hier um Erbarmen gefleht wird. Im zweiten Teil wird weiter so verfahren; besonders bemerkenswert ist der plötzliche harmonische Stillstand bei „iniuste egimus“, der durch den Einsatz von Orgelpunkten hervorgerufen wird; es folgen zwei sequenzierende Abstiege auf leere Quinten bei „iniquitatem fecimus“. Die Motette Peccantem me quotidie ist noch stärker von dem Bedürfnis nach Buße und der Angst vor dem Tod getrieben: Die Worte „timor mortis conturbat me“ (die William Dunbar, ein schottischer Dichter des fünfzehnten Jahrhunderts, in seinem Klagegesang Lament for the Makers so erschütternd aufgenommen hat) sind in schlichten Blockakkorden gesetzt, betreten jedoch symbolisch neues harmonisches Terrain. Es findet bei den verzweifelnd absteigenden Phrasen von „nulla est redemptio“ sozusagen eine hörbare Verfinsterung statt, doch mit dem erschreckenden Flehen um Gnade bei „Miserere mei, Deus“ wird das Ende des Werks vom Licht der Hoffnung umströmt. Beide Motetten setzen, so scheint es, den Spruch des orthodoxen Mönchs Staretz Silouan um, der da lautet: „Bleib in Gedanken bei der Hölle und verzweifle nicht.“ Auch wenn es heute noch als überholt gilt, derlei spirituelle Anliegen in seine Musik hineinzulesen, darf man nicht vergessen, daß Palestrina mit seinem Schaffen bei der Herausbildung einer Spiritualität der Gegenreformation an ganz zentraler Stelle stand. Wie Lewis Lockwood es beschrieben hat: „Seine Laufbahn zeichnet sich nicht nur durch enorme künstlerische Kraft und Produktivität aus, die er mit großer Zurückhaltung walten läßt, sondern auch durch tiefe Frömmigkeit, gepaart mit einer gewissen weltlichen Strebsamkeit“ (Stichwort „Palestrina“ im Musiklexikon The New Grove Dictionary of Music and Musicians). Laudate pueri aus der 1572 erschienenen Motettensammlung und das 1575 veröffentlichte Cantantibus organis zeigen Palestrina von seiner festlichen Seite, mit überschäumender melismatischer Stimmführung und—vor allem beim ersten, für zwei Chöre angelegten Werk—geschicktem Umgang mit strukturellen Kontrasten. Das siebenstimmige Tu es Petrus aus dem Liber primus motettorum von 1569, das weniger bekannt ist als die spätere sechsstimmige Vertonung, ist außerdem eine Verherrlichung des unverbrüchlichen Glaubens an die Kirche Petri. Das nahtlose polyphone Fließen, wenn auch nicht das harmonische Idiom des Werks lassen an Komponisten wie Morales und insbesondere Gombert denken. Das vorliegende Magnificat ist eines von fünfen, die Palestrina im Tonus 4 geschrieben hat. In der Tat hat er den Text des Magnificat nicht weniger als fünfunddreißigmal bearbeitet; sechzehn seiner Vertonungen sind im Magnificat octo tonum liber primus erschienen, das 1591 in Rom herauskam. Es ist ausgesprochen schade, daß man sie heutzutage kaum kennt, denn sie sind typisch für Palestrina: ein Diener der Kirche, der in aller Stille prachtvolle Musik schreibt, die selbst heute—wahrscheinlich besonders heute—die Menschheit direkt anspricht.